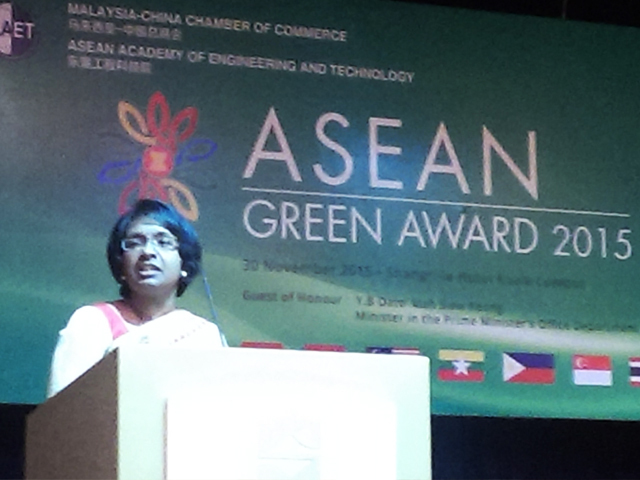 Dr Sumathi a/p Sethupathi, Head of Department of Environmental Engineering in UTAR Faculty of Engineering and Green Technology, was chosen as the Green Award Country Winner for Malaysia in the ASEAN Green Award 2015 held on 30 November 2015 at Shangri-La Hotel, Kuala Lumpur. In addition, she was also 2nd Runner-up in the ASEAN Green Award Grand Winner category. 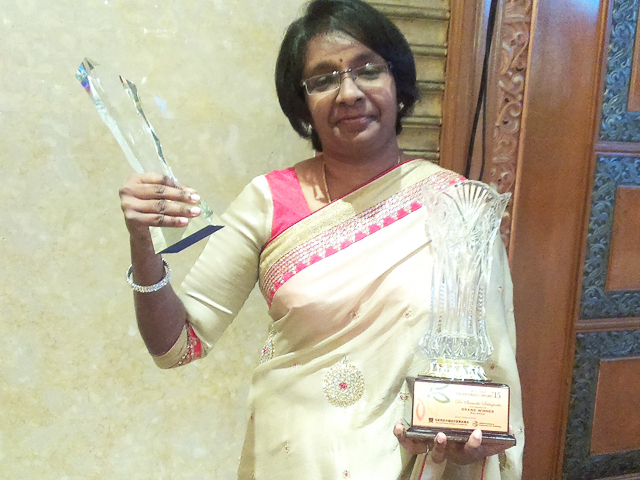 As a recipient of the Green Award Country Winner, Dr Sumathi received a trophy and USD1,000 cash prize, while as 2nd Runner-up in the ASEAN Green Award Grand Winner category, she received USD2,000 and another trophy. A gala dinner was held at the Shangri-La Hotel during which the awards were presented to the various winners from ASEAN nations comprising of Brunei, Cambodia, Indonesia, Laos, Malaysia, Myanmar, Vietnam, Singapore, Thailand, and the Philippines. Dr Sumathi’s research work focused on sustaining our Earth’s resources by finding alternative resources through waste. She reutilises solid waste such as fishery waste, egg shells, and palm oil mill biomass, and converts them into value added products such as chitosan, biochar, activated carbon, and adsorbents. She is also using the value added products to solve other environmental problems such the removal of dyes, oil, and heavy metals from wastewater and the absorption of air pollutants such as sulphur dioxide and nitrogen oxides. She is also active in educating youths on environmental awareness. She runs campaigns and awareness programmes to youths on Ecological Footprint, the importance of the environment, how to sustain it, and how to overcome environmental problems by applying green concepts. By reducing waste, our ecological footprint will indirectly be decreased. “People say that sustainability is the key to the resources of the next generation but I believe that wastes are the resources to build a more sustainable future,” adds Dr Sumathi. The ASEAN Green Award was held for the fifth time since 2011 to promote the concept of green growth in ASEAN member countries. The ASEAN Academy of Engineering and Technology (AAET) and the Malaysia-China Chamber of Commerce (MCCC) had jointly initiated the Annual ASEAN Green Award for the younger generation in ASEAN. One of the goals of this initiative is to recognise the outstanding young green technopreneurs and young contributors to the green growth in the ASEAN region. 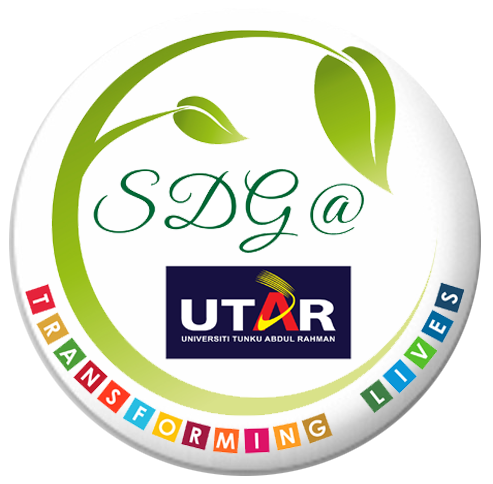 It is also to promote the development of innovative products or solutions that meets the goals of environmental sustainability.